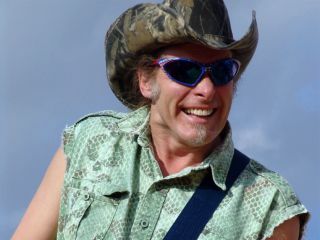 Ted Nugent is perhaps just as well-known for his gun-toting political views as he is for guitar playing. But placing his pro-hunting activism to the side for a moment, let's take a look at The Nuge's platinum-selling music career. Ted began touring in 1967, averaging more than 300 shows per year. After a brief spell as The Amboy Dukes, Nugent released his self-titled debut album in 1975, closely followed by Free-For-All in 1976, which featured a young Meat Loaf on vocals. 31 recordings and 35 million-sold albums later, Ted just played his 6000th gig in Michigan, Detroit. Other notable Nugent achievements include two of the best-named live albums we've ever heard: Intensities In 10 Cities and Full Bluntal Nugity. He's also the proud author of the essential 'Guide To Preparing And Cooking Game And Fish': Kill It & Grill It. MusicRadar is talking to The Nuge this week and, as always, we're giving you the chance to ask the questions. Simply add one to the comments below (you'll have to be registered and logged in to do so). We'll pick the best and ask them during the interview.